Since winning Channel Four's prestigious 'So You Think You're Funny?' Competition at the Edinburgh Festival in 1998, an award previously won by Phil Kay, Dylan Moran, Lee Mack, Tommy Tiernan and Peter Kay, Rob has been a regular performer at major venues on both the London and National circuit. Rob has returned to Edinburgh three times; in 1999 compering The Comedy Zone at the Pleasance and co-wrote and performed The Big and Daft Comedy Show, winning critical acclaim and returning in 2000 with Big and Daft in Space, and 2001 with The Big and Daft Christmas show, massive hits with punters and critics alike. Rob is headlining the Comedy Network for a third season this year, performing at Universities Throughout the British Isles. Rob has toured with Phil Kay, taking him to both Hungary and Poland and has recently returned from a tour of Amsterdam. 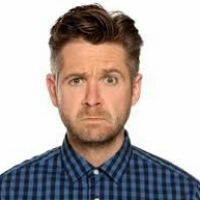 His TV credits include presenting the first series of The Friday Night Project on Channel 4, the C4 sketch show Spoons, and playing Mike in the first series of he BBC3 sitcom Grown Ups.